Product prices and availability are accurate as of 2019-04-21 18:01:29 UTC and are subject to change. Any price and availability information displayed on http://www.amazon.com/ at the time of purchase will apply to the purchase of this product. 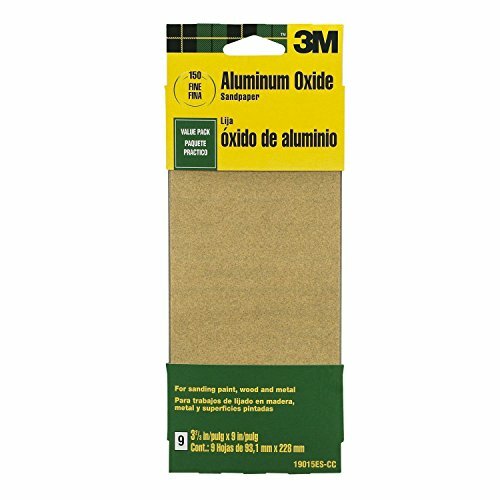 3M General Purpose Paint, Wood, Metal Aluminum Oxide Sandpaper 19017ES-CC, 3 2/3-Inch x 9-Inch, 60 Coarse grit, 8/pk, Open Stock. This coarse grit aluminum oxide sandpaper is used for general purpose sanding on paint, wood and metal. Use it by hand, on a sanding block, or cut it to size for a power tool sander. Be sure to sand with the grain of the wood and always work through a sequence of grits, from coarse to very fine. Also available-Inch flexible sanding sponges for flat and contoured surfaces like raised panel doors, cabinets or windows. Choose a block sanding sponge or for hard to reach areas, like corners;try one of the angle sanding sponges.